Shifting gears a bit, we all know that most tech folks are also geeks. Robby the Robot has got to be on my top 10 list of just cool things. Robby is from the Sci-Fi movie Forbidden Planet. Forbidden Planet was made in 1956 and stared Walter Pidgeon as a scientist who colonized on a planet and discovered a long lost civilization called the Krell. He finds an underground lab they left behind that has a cool science gizmo that makes him a genius. He goes on to make his assistant - Robby. Robby was one cool character in the movie. Well Hallmark who are well known for their greeting cards also makes an astonishing amount of ornaments and they always gift us with some cool sci-fi stuff from Star Trek, The Jetsons and many other classics. 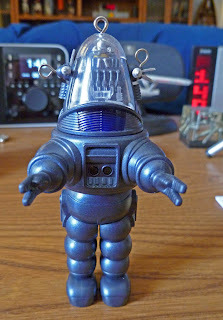 I made a quick video of Robby the Robot from Hallmark. He talks and has several phrases from the movie.